With the the heavy lifting of building and procuring collaboration solutions begins. For many IT professionals in the enterprise, this endeavor not only includes making use of legacy collaboration assets from multiple vendors—room-based video conferencing systems and UC tools—but procuring new solutions to enhance and expand their collaboration practice as well. What’s more, all solutions must work together seamlessly to produce the desired user experience. In the PROCURE section of this site, we explore common questions and considerations that need to be addressed to achieve a fully integrated collaboration environment. 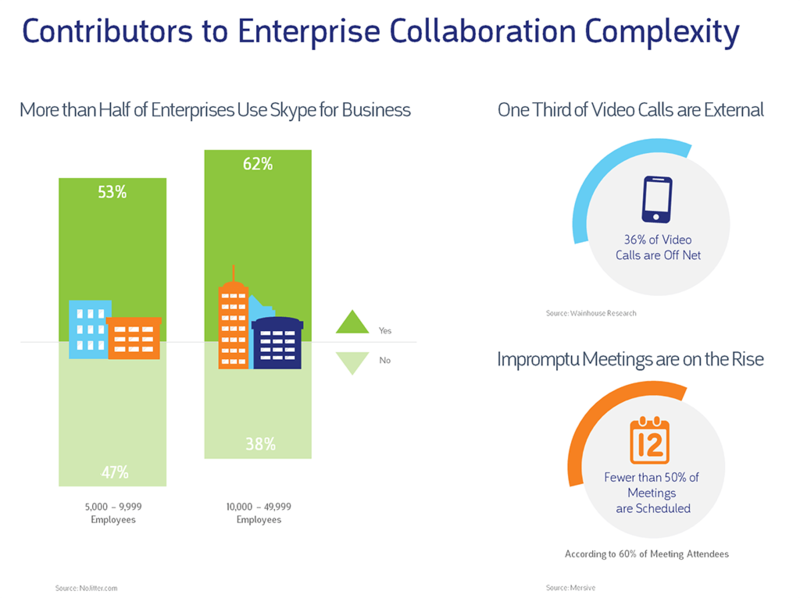 Start with the tech brief below to learn more about what’s influencing the current state of enterprise collaboration. In a connected and collaborative work environment, the ultimate user experience is a single click of a button to launch a meeting from any device, room, or platform. This ideal minimizes training and all but ensures user adoption. But achieving this ideal isn’t always easy. The reality for many enterprises is that the tools and solutions from multiple vendors don’t fit together well, resulting in a collaboration environment that resembles what Frost & Sullivan calls a In this disconnected state, users avoid video conferencing rooms that can’t connect to their preferred tools and IT teams are strained to manage and support rooms as well. And the number of button clicks to start a meeting? Well that depends entirely on which room users happen to book and which platform the meeting organizer decides to use. 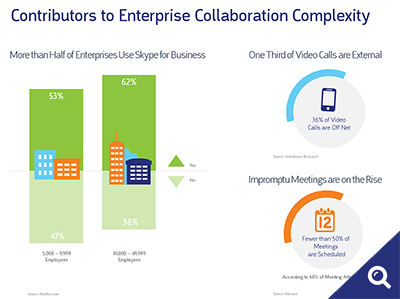 In enterprises with 5,000 or more employees, 53% use Skype for Business. That number surpasses 60% in organizations with more than 10,000 employees, according to No Jitter. From an individual user perspective, it’s easy to start a meeting with other Skype users on desktops or mobile devices. The complexity begins when you need to join users in a Cisco or Polycom video conferencing room to a Skype for Business meeting—a very common scenario. These tools simply weren’t built to work together out of the box. It will require third-party integration to achieve a seamless user experience regardless of room or platform—but it can be done. The majority of enterprise video calls are still internal—calls for internal team management, work meetings, and the like. However, external or off-net calls are on the rise. Wainhouse Research shows that a which is an increase over 2013 and 2014. The distinction between external and internal is important because your network and security requirements will be different for each. External calls can also introduce a host of technology integration issues based on the types of tools external clients, vendors, or others use to connect to your internal users. Would you like to receive more information about collaboration topics in your inbox? Join our email list. User expectations for impromptu and scheduled meetings is another area that needs to be well explored and documented to ensure a successful delivery of your collaboration program. Traditional scheduling will always be important because it allows rooms and AV assets to be booked in advance and enables users to look up meeting details. A however, found that for half of meeting participants, only 25-50% of their meetings are scheduled. The impromptu meeting is a natural extension of today’s mobile, connected workforce. The complexity is in delivering an experience that allows for easy escalation from presence to IM to an audio call to a video call to an impromptu meeting with some or all participants joining from an available meeting room. Top it off by making that impromptu meeting experience as close to a single button click as possible. When the impromptu meeting experience works well—because it was engineered to—users can serve themselves instead of relying on IT, creating a more efficient and streamlined collaboration environment. Cisco, Biamp, Crestron, NEC, and AVI-SPL discuss the challenges of complex collaboration environments. Read . Contact AVI-SPL at 866-559-8197 or simply complete the short form. One of our Collaboration Solutions team members will contact you about the Collaboration Program Assessment. And the number of button clicks to start a meeting? Well that depends entirely on which room users happen to book and which platform the meeting organizer decides to use.